Find a therapist in Utah with GoodTherapy.org. Nearly 3 million individuals lived in Utah in 2015. It is estimated in that year, 91.2% of people were white, 1.3% were black, 1.5% were American Indian and Alaskan Native, and 2.5% were Asian. Older people age 65 years or older accounted for 10.3% of all residents, while minors accounted for 30.5%. Roughly 49.7% of the population was female in 2015. 17,570 people work as licensed social workers, counselors at depression treatment centers, nurses at residential treatment centers, religious workers, or in related social and community service positions in Utah. Therapists and people who work in similar community and social service fields in Utah earned an average annual wage of $41,500. Out of all 50 states plus the District of Columbia, Utah received a anking of 46th overall from Mental Health America (MHA) in 2016, meaning there is most likely a combination of low access to care and high instances of mental health issues. MHA researchers hypothesize a relationship exists between Utah’s bottom-10 overall ranking and high rates of toxic chemical release in the state. In other major mental health categories, Utah was 51st in adult ranking, 27th in youth ranking, 43rd in prevalence of mental health and substance dependence issues, and 35th in access to mental health services. Data from the 2016 MHA survey suggest a high prevalence of mental and emotional issues exist among both the adult and youth populations in Utah. Therapists and mental health analysts who conducted the survey posit Utah has the second-highest percentage of adults with mental health issues, the highest percentage of adults with strong suicidal ideation, and the second-highest percentage of young people with episodes of major depression in the past year. Utah also has the lowest percentage of adults and adolescents with substance dependence or substance abuse issues, ranking 1st in each of these categories. 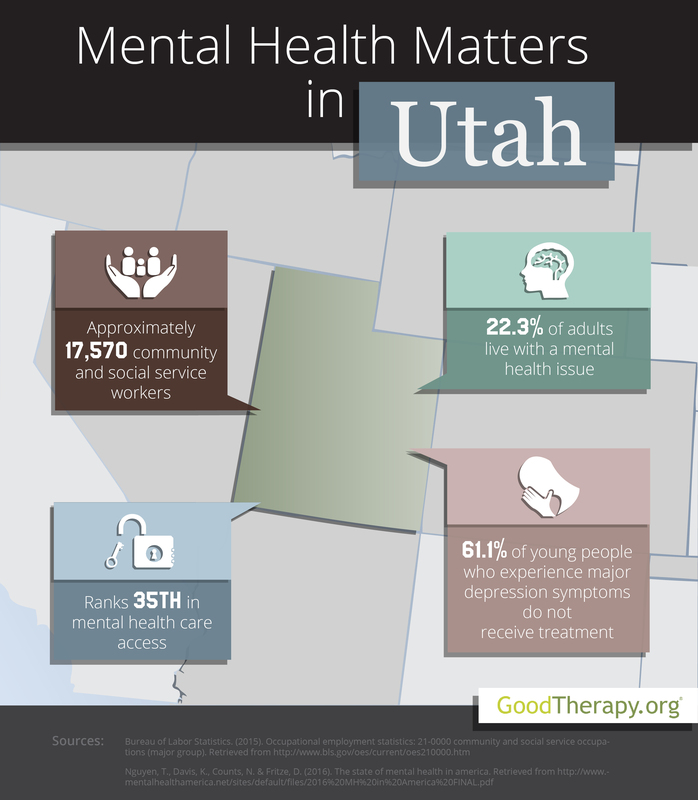 Of the 437,000 adult residents with mental health issues, Mental Health America reveals 129,000 individuals attempted to find a therapist in Utah, but did not receive sufficient treatment. The state is ranked 43rd for adults with mental health issues who do not have insurance. In a 2014 survey, the Substance Abuse and Mental Health Services Administration (SAMHSA) states a lower percentage of adults and adolescents in Utah report improved functioning after using the public mental health care system, compared to the nation as a whole.